Our Shanghai tour guide will pick you up at your hotel lobby, holding a paper sign with your name on for you to recognize, and then you will be transferred to Shanghai South Railway for your train to Beijng. Upon your arrival, our Beijing tour guide will pick you up at Beijing South Station. Have lunch and then visit the Summer Palace, the lovely summer retreat of the imperial families. You will also have a pleasant boat ride in its beautiful lake. Today you will witness the marvelous world heritage-Great Wall. We will visit the less crowded section-Mutianyu Great Wall. The round-way cable helps you up and down a good section of the wall for walking and sightseeing. After lunch back to downtown to visit the Temple of Heaven. It is an impressive architecture where emperors of Ming and Qing dynasties held annual pray ceremonies for good harvests. 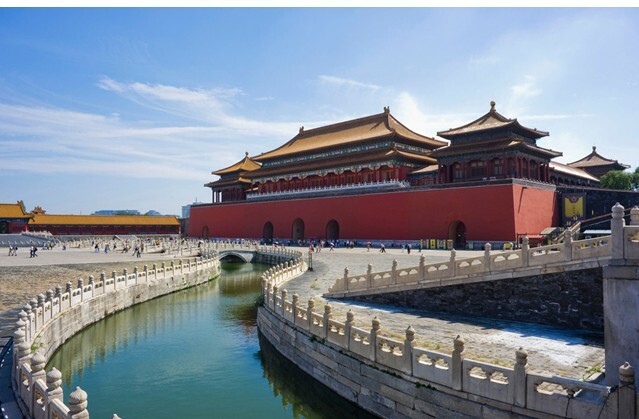 Today we will explore the two most popular Beijing attractions-the gorgeous imperial palace-the Forbidden City where 24 empeors of Ming and Qing Dynasties lived, and the nearby Tiananmen Square, which is the world’s largest city square and is taken as the symbol of China. After the tour, you will be transferred to train station to catch the train back to Shanghai. Upon your arrival our Shanghai tour guide will pick you up in time. *High-speed train tickets: Shanghai-Beijing, Beijing-Shanghai. I am interested in the cost of this tour. I am planning on coming to China in early July. We are planning to visit friends in Shanghai in early May 2014 and are interested in your “3 Days Beijing Tour from Shanghai by High-Speed Train”. Would you please send us information regarding prices and recommendations for any other China tours that originate from Shanghai. We just sent an email about your questions, please check. Just wondering what the price is for this tour. My wife and I are going to be in Shanghai last week of May. Hi I will be in shanghai next week. Do you have any Beijing tour starting friday late afternoon / evening on Aug 14th and back in Shanghai Aug 16th? Also can you please send me details of sites covered and cost including /excluding hotel stay in Beijing. Interested in price of this tour for 3 people! Looking to leave the afternoon of March 25, 2016 and returning on March 28th! How long is the train ride? Is there a tour that offers airfare one way and train the other?